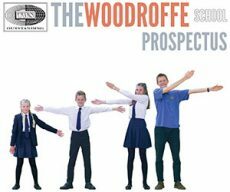 Woodroffe has, for many years now, been oversubscribed and every year there seems to be increasing competition for places in Year 7. This year, for example, there were over thirty appeals and far more first choices than we are able to cater for. Much of the school’s reputation is down to word of mouth and we really need to do very little in terms of promotion or advertising. It is interesting, therefore, to see the reaction of prospective parents to the stunning range of extra-curricular activities that take place here: they are often genuinely surprised that we do so much. This is especially true of parents who are new to the school. It doesn’t take long to realise why this is. Although we have a colourful and vibrant website, which is updated regularly, and we produce a packed edition of Rough Notes every month, Woodroffe is largely absent from the local press. This is, of course, due to geography. As you know, Woodroffe is a Dorset school which sits right on the edge of the county. Indeed, our playing fields are actually in Devon. Consequently, we rarely feature in The Dorset Echo, and coverage of Lyme in The Bridport News is sketchy to say the least. As far as the media in Devon are concerned, Woodroffe is a Dorset school, so they don’t need to cover anything that happens here, despite the fact that over 50% of our students live in Devon. It is a source of immense frustration to our staff and governors that we frequently read about events in other local schools which are reported with considerable excitement when we know that similar, and often much more inspiring things have taken place here. The recent Remembrance Day Centenary events are a case in point. Anyone reading The Bridport News on the thirteenth of November would have assumed that the school did nothing to mark the occasion, a view which would have been reinforced by the coverage of the two major events, Pages of the Sea and the poppies on Colmer’s hill. While it is probably understandable that Woodroffe’s contribution to the poppy display was not remarked upon as so many schools took part, the failure to mention the school’s role in Pages of the Sea is unforgivable. This was a national project led by Danny Boyle which featured on every television news bulletin. It took place in 30 specially selected locations across the country and resulted in the production of amazing drawings in the sand, pictures of which you can see later in this newsletter. The drawing in the sand on Lyme Regis beach was created entirely by Woodroffe sixth formers as part of a three-day project led by our Head of Art, Richard Vine. The work they did was outstanding, but not only was there no mention of Woodroffe in the newspaper article, none of the students were named and they didn’t even appear in the photographs. Full details can be read on our website: https://www.woodroffe.dorset.sch.uk/2018/11/pages-in-the-sand/. There is some good news, however. The publishers of Lyme Online have offered to include a regular Woodroffe page in the digital edition of their news bulletin. This can be read at http://www.lyme-online.co.uk. 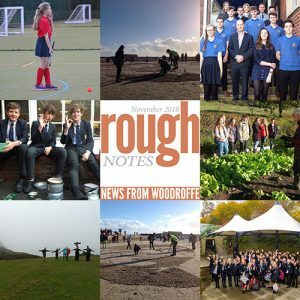 So, let’s hope that more and more people who don’t read Rough Notes regularly will get a chance to see just how much goes on here and just how much Woodroffe pupils contribute both to the life of the school and the local community.